As I headed to grab my badge I saw groups of business men chatting amongst themselves about films being bought and sold at the event, and the general state of the film industry. As I walked around the pavilion I kept overhearing conversations about collaborations on films and various projects producers are working on. They seemed to be geared for a week of industry back-scratching. I heard about the crazy night life and red carpet events, but the strong presence of business deals at the festival is something I never really thought about. After attending a screening I walked outside of the main building and ran into the cast of "Pal Adrienn," a Hungarian film screening in Un Certain Regard. I could tell that they just walked out of their premiere as they were dressed to dazzle while posing for the paparazzi. Like many actors at screenings or walking the red carpets at Cannes, the cast was making sure to give photographers their best angle and exude a sense of pride and joy with the public when they approached them to take pictures. It was interesting to see how some of these actors were treated like celebrities by people from their own country, yet not recognized on the streets. It seems that the heavily populated festival is one traffic jam after another. It can be very tiring if you have to run from one event to the next. Being stuck on the street like a canned sardine made me a bit irritable. So when I started to feel like a deflating balloon, I decided to catch up with a few of my friends at the American pavilion. This is one of my favorite pavilions; the spaciousness of it gives respite from the crowded street of Cannes. On my way out, I passed the Indian pavilion. The modest size and sparse accessories certainly did not do justice to the enormousness of their film industry. Come on now, Bollywood is the largest film industry in the world! Perhaps the Indian pavilion will improve tomorrow for the Bollywood event I plan on attending there. 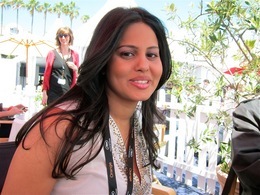 Later, I met up for lunch with some friends who are Indian film producers and regular attendees of the festival. All their talk about equity, made my head spin! It was clear that when it came to films, they took a renaissance approach, understanding the aesthetic, economic, managerial and political facets of the industry. They once again reminded me of the strong presence of business at the event as they discussed their chock-a-block schedules, filled with the names of prominent producers and financiers they were planning to schmooze with. Oh the business! I enjoy not having to think about it, never understood the complexity of dollars and cents. It's no secret that the film industry is part commerce and part artistry, and I am glad to only have to deal with the latter. After lunch I left to view an art exhibition that my friend from New York was hosting at the Carlton hotel, a place known to host the who's who of the film industry during the festival, as well being the undisputed headquarters of motion picture industry deal-making during this time. Stepping into The Carlton, felt like being in a time warp, the regal-ness that journalists have written about for years coming to life. As I walked up to the hotel I was distracted by the larger than life movie posters that covered up parts of the hotels exterior. There were ones from the Bollywood film "Raavan" staring Aishwarya Rai Bachchan, as well as "The Last Airbender" and many more. The lobby was crowded with the sophisticated set one would expect to see at the Carlton. People are definitely more casual during certain events and screenings in the festival but when they step into the Carlton it seems like they want to match the elegance of the hotel. As my friend Matt took me around the art exhibition I enjoyed viewing some unique works from artists around the world. Apparently this exhibit is a film festival tradition, a good one I must say, as it is an opportunity to for artists to have some of the world's most distinguished people in cinema view their work. 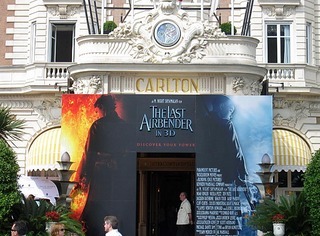 Who would think that people were selling more than films at Cannes? I headed back to doll myself up for the night. From yacht parties held by production houses, to Hollywood producer Ashok Amirtraj's 100th film anniversary party, I had a host of evening soirées to pick from. In stiletto heels and a little black dress I was ready to paint the town red. Back at the Carlton, my heart stopped as I nearly crashed into the man known as the great "Showman" in Bollywood, acclaimed producer/director Subhash Ghai. Despite the fact that I nearly trampled over him, he was kind enough to give me a hand as I struggle to gain composure. Certainly not an everyday event for little old me. All I can say is "thank you" Cannes for making it happen! As the night went on, I headed to a few more events and ended my night meeting with my good friend, celebrity DJ Kayper at Variety magazine's event. As I listened to her play fusion tracks spanning the East and West, I felt as though it reflected the collaborations that seem to be the flavor of the season. It was a lovely first day at the colorful Cannes Film Festival. I can't wait for tomorrow where my day is filled with Bollywood flavor!